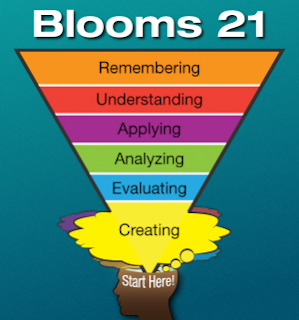 Creating is at the highest level of Bloom's Taxonomy for a reason. Creating allows students to internalize information in order to create products to display their learning and understanding of different concepts. As a technology teacher, I have researched, explored and analyzed lots of different online apps and webtools. Out of all the online apps that I have stumbled across, these are my favorite for students to use to create their own projects to display concept mastery. The catch to using "free" online applications is that most of these apps require an account in order to use them. To get around this issue, I create one login with a very generic username and password for all of my students to use. This way, each student will not have to create his or her own account, and they can all create their projects and upload them to the same account, making it very easy to share. In addition, if students find that they really like the online app that they are using, I encourage them to create their own account so that they can have ownership of their projects to collect in their e-Portfolio. So without further ado, Get Your Students Creating! I hope that you and your students find these online applications as useful as my students do! Google Docs is a great online application to get your students creating, collaborating, and sharing documents, spreadsheets, forms, presentations, drawings, and tables. Glogster EDU is an awesome application to create an interactive poster full of multimedia such as sound, pictures, video, creative text, links and much more. You can even embed all of these types of multimedia on one poster which is really cool. If you create an account as an educator, you can grant access to your students. Canva "allows anyone to become a designer" It is a simple, drag-and-drop, design software that’s completely online and free to use. Conduit Mobile allows anyone to create quality mobile apps once and deploy on all platforms. Develop, publish, promote, and monetize your app. No coding required! By cutting the technical workload, they allow publishers to focus on the content, delivering apps quickly, simply, and across all mobile devices. What's more, it's all absolutely free. Animoto Education is one of the best video editing and digital storytelling apps out there. If you create an account as an educator, you can grant access to your students. Youtube Editor is an easy-to-use video editor that allows you to trim video clips, add music, add effects, add text and much more, all online. You can even pull multiple YouTube videos together to make one YouTube video. Prezi takes your presentations to the next level. The effects and transitions are extremely visually appealing and it is very easy to use. Introduce this new style of presenting and your students will thank you! Popplet is an outstanding graphic organizer app that allows you create mind-maps full of multimedia such as pictures, video, text, etc. This also serves as a great brainstorming platform for students. Pixlr allows you to create your own drawings, edit your own pictures, or edit pictures downloaded from the internet. Pixlr is an online app that is very similar to Paint, but its readily accessible because its online. Aviary is a very sophisticated audio editor for a free online application. Create a podcast, a public service announcement, a commercial, or a radio talk show with this awesome app! TikiToki allows you to create an interactive timeline full of multimedia! The colors are vibrant, its easy to use and the possibilities are endless! Many Eyes is a powerful graph creator provided by IBM. This online app allows you to either search graphs and charts that have already been uploaded, create your own graph from data that is in the database, or create a graph by uploading your own data. This is a great way to make infographics and other neat visualizations. Digital Storyteller is a digital storytelling app developed by the University of Virginia. This app allows you to easily create your own digital story by uploading multimedia, entering text and recording your own voice. The design of this app makes it very easy to use and you can create your own digital story in minutes. Myebook is a free app that allows you to create, store, and share your own ebooks. The ebooks are also interactive by allowing you to grab the corner of each page and physically turn it backward or forward to navigate throughout the ebook. MapMaker is an awesome app provided by National Geographic that enables you to create your own maps using an interactive world map. You can navigate, mark, draw, measure, link and share your maps. You can browse by regions to explore, or you can browse by themes such as climate, population and culture, or politics and economics. Google SketchUp allow students to practice designing and engineering in their own "digital" backyard. The possibilities are endless by creating architecture such as houses, buildings, etc. Upload your creation to the online warehouse, or browse and download creations from the warehouse right into your own backyard. To view my favorite ways for students to publish their projects to keep in their e-Portfolio, visit my blog: 12 Free Online Apps to Get Your Students Publishing.